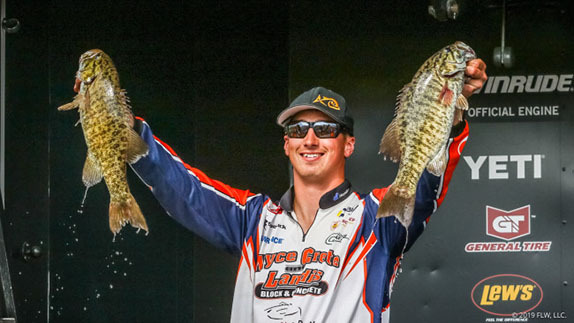 Two bags in the 13 1/2-pound range have put Bill Lowen atop the standings at the Winyah Bay Bassmaster Elite Series. 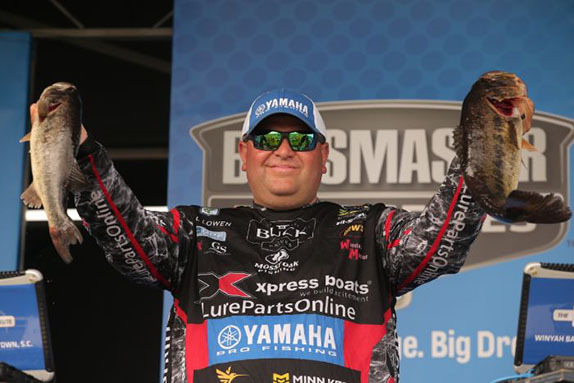 Bill Lowen is averaging a just over 13 1/2 pounds a day at the Winyah Bay Bassmaster Elite Series, with just an 11-ounce difference between the weight of his two bags thus far. Two more stringers that start with that fabled unlucky number might earn him his first victory in his 14th year on the circuit, but such feats are far easier to project than they are to pull off on a fishery that only grudgingly surrenders even small keepers. 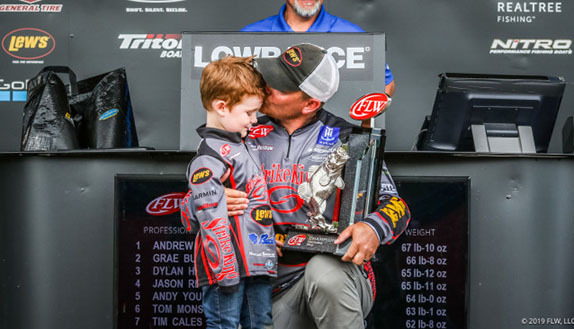 Lowen's 13-15 haul on day 2 moved him from 4th place into the lead with a 27-03 total. He'll carry an 11-ounce advantage over rookie Luke Palmer into the weekend. Palmer boxed 12-06 to push his total to 26-08 as he moved up one place in the standings. Fellow rookie Lee Livesay, who started the day in 44th, caught a tournament-best 17-03 to rocket up to 3rd with a 24-14 aggregate. 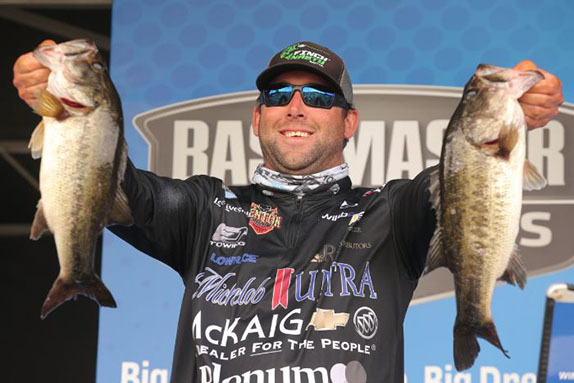 First-round leader Jason Williamson managed just 8-11 on day 2 and dropped to 4th with 24-06. Jesse Tacoronte, who gained 10 positions with his 13-07 bag, rounded out the top 5 with 24-05. Stetson Blaylock, bidding for his second single-digit finish in as many weeks, led the second half of the top 10 with 23-13 in the wake of a 12-07 sack. He was followed by Fletcher Shryock (who fell only five positions despite a three-fish, 8-01 bag) with 23-09. Bill Weidler caught a 14-10 sack and moved up 29 places to 8th with 23-04. Cory Johnston was 9th with 22-14 (11-12 on day 2) and Clifford Pirch was 10th with 22-12 (10-06). Weights were up a bit from the previous day as the sky turned gray and the wind picked up. Similar conditions are predicted for day 3 before a final-day forecast that calls for morning showers and a stiff wind approaching 20 mph, which could make it rough on the competitors making the 100-mile run to the Cooper River. 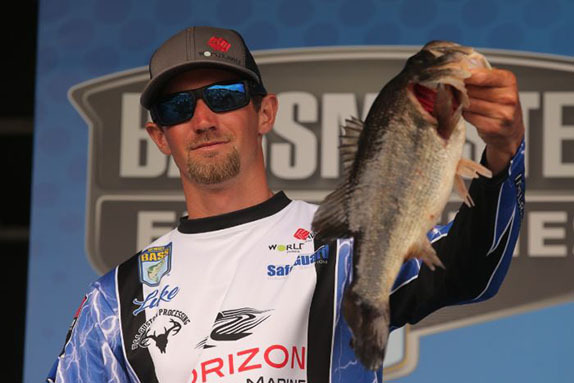 Luke Palmer caught a smaller bag than he had on day 1, but moved up one place in the standings. Garrett Paquette and Brandon Card were the final anglers inside the top-35 cut as they registered 17-15 totals. Paquette was in 2nd place when the day began, but boated just two fish for 5-07. Lowen said he's fished the same way in the same places on both days. A spinnerbait has been his primary producer. He has a lot of water to work over and is sharing it only with Dale Hightower, who made the cut in 31st. "I'm just going up and down a big creek arm and fishing the inside and outside bends," he said. "I got about 12 to 15 bites yesterday and about the same today. "The depth all depends on which side I'm on � sometimes it's eight feet right off the bank and in other places it's a tapering deal." He thinks the creek will continue to produce regardless of what the weather does. "I would hope so. They're all current-related fish." Palmer is fishing in the same general area as Livesay. His weight was down 1 3/4 pounds from the previous day, but he wasn't complaining. "I'm tickled to death with that," he said. "It was a long, miserable day." His primary area is an 80-yard stretch of hydrilla in the Cooper that sits on a shallow ridge. He's been forced to share it with a couple of other anglers, but they failed to make the cut and he should have it to himself the rest of the way. He went through about a dozen keepers, but caught several after a location change that didn't help his cause. His bag was topped by a 4-pounder. "I missed several fish in my main area and if I could've capitalized on one or two of those, I'd have had a really good shot at leading right now," he said. "But we're only two days in and maybe I can catch those fish another day. "I think there's still fish there, but I don't know how big they are. I might be able to do pretty well if I don't have company." Livesay's big haul included three fish in excess of 4 pounds apiece, including a 5 that he caught on his last cast swimming a Finch Nasty U-Jig. 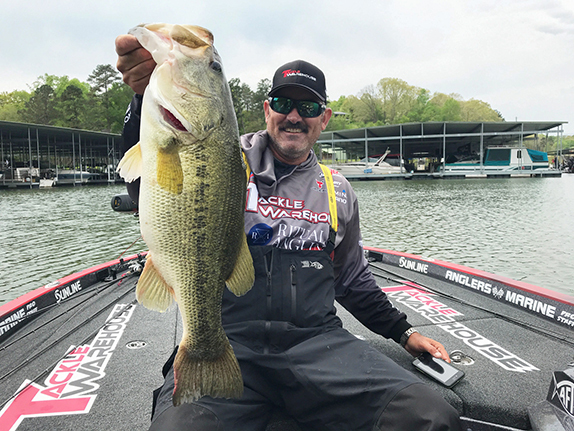 He's running to the Cooper and then taking Chicken Creek to the Back River, which is a two-hour run from the launch in Georgetown, S.C.
Lee Livesay caught a tournament-best 17-03 on day 2. "The weather change was the biggest thing � some clouds rolled in and they started eating the bait," he said. "Yesterday they were blowing up behind it and missing it. "I've seen the right kind of fish in there every day; I've just got to get them to commit. If it's cloudy and blows about 5 to 8 mph, I've got a shot. It blew a little too hard today." Williamson was a bit irked to find a lot of company in the area where he'd caught his 15-11 stringer on day 1. He handled seven fish on day 2, but none over 3 pounds after catching a 6-10 giant on day 1. He's not running to the Cooper, opting instead to fish the much closer Waccamaw River. "I had a couple things working against me today," he said. "No. 1, when I got to my starting area where I'd been catching them, and there were seven other (Elite competitors) in there and it was kind of a (circus) this morning. Some of those guys I didn't see yesterday at all and it was pretty disappointing. "The other thing that made it harder was the east/southeast wind kept the tide pushed in and it never fell out. They feed best when it's close to low tide and then the first few minutes of the incoming and we never had any of that. It just dropped a little and then stayed stable." He won't deal with the crowd again on day 3. "I'm going to run new water and let them have it � I don't think I can catch what I need to catch there. I might start there for a little while, but I'm not going to get hung up on it." > Day 2 stats � 60 limits (2 fewer than day 1), 8 fours, 3 threes, 3 twos, 1 zero (same as day 1).